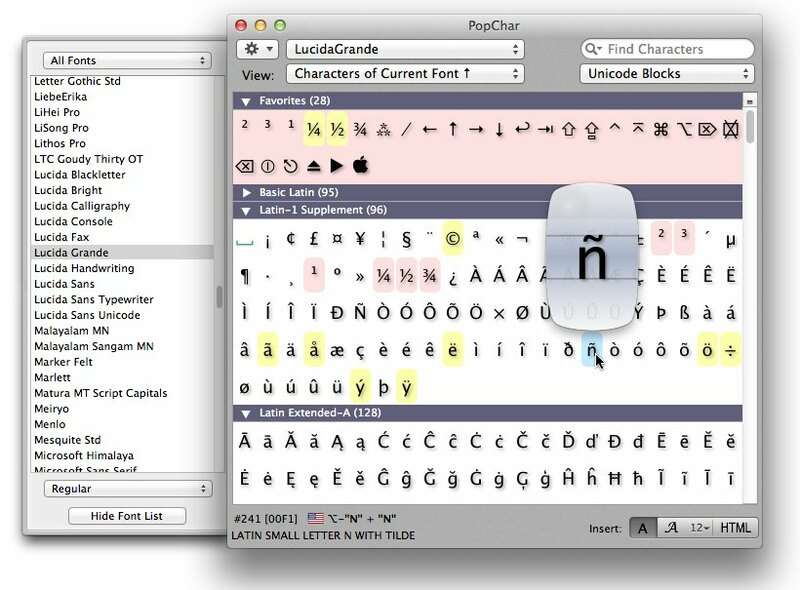 PopChar 7.2 – Floating window shows available font characters. PopChar X helps you get the most out of your font collection. With its crystal-clear interface, PopChar X provides a frustration-free way to access any font’s special characters. Your Mac includes over 700 fonts, each of which contains thousands of characters — Why not make them as accessible as possible? PopChar X makes it happen. PopChar X displays easy-to-analyze tables of characters, giving you an ultra-convenient interface. You can’t access most of these characters from your keyboard — PopChar X puts them within your reach. No matter what app you are using, PopChar X brings snappy simplicity to all font-related tasks. Whether you’re working with a word processor or a Web browser, PopChar X integrates seamlessly. PopChar X’s seasoned search capabilities will help you find what you are looking for, whether you need to search for a character by name, identify fonts that contain specific characters, or explore the entire character set of a font. PopChar is prepared for El Capitan (solves a problem that resulted in empty character tables). PopChar now includes searchable descriptions and Mandarin pronunciations of Chinese characters, according to the Unicode standard. PopChar now shows a small keyboard symbol next to the keyboard combination for the selected character. Loading of character names when the PopChar window opens is now about 6 times faster. Produces fewer console log messages when searching for shapes and importing favorite characters. The character description at the bottom of the table consists of up to two lines for longer descriptions. Works around a situation in which a new version could not be installed because an active older version would not quit. Fixes a problem that caused the "Mark Fonts Containing…" command to fail for characters outside the first Unicode plane. Works around a cosmetic issue with vertical offsets of characters from different fonts. More robust handling of font families with inaccessible font members (which also solves a problem with fallback fonts on El Capitan). Fine-tuned size adjustments for more than 20 fonts, in particular many fonts for Arabic. Works around a problem in MS Word 2016 that caused the creation of bookmarks around copied text fragments. Works around an issue that caused PopChar to become unresponsive when FreeHand was the current application. Fixes an insertion problem in CorelDRAW. Next story Hider 2.2.4 – Hide, encrypt, and password-protect your data. Previous story Echofon 1.8.7 – Syncs unread Tweets with your iPhone. RightFont 3.0.1 – Manage and find fonts quickly; integrates with Photoshop and Sketch. PopChar X 6.6 – Floating window shows available font characters.